I'm not even sure, nor do I care, if patches and pins are still trendy. I am and always will be obsessed with them. I don't know what it is, but I'm just such a fan of the way they look and personalising an item of clothing always feels so cool. If you cast your mind all the way back to last October, you might remember that I've already done a post like this, but since subscribing to a few pin-related emails and following a bunch of pin people on Instagram, I was feeling the need to do another. I've also just bought my first ever black denim pinafore dress and it's just begging to be blinged up a little! That pin you see above is from Punky Pins (who also made an appearance in my other patches 'n' pins wishlist), and it just speaks to me. 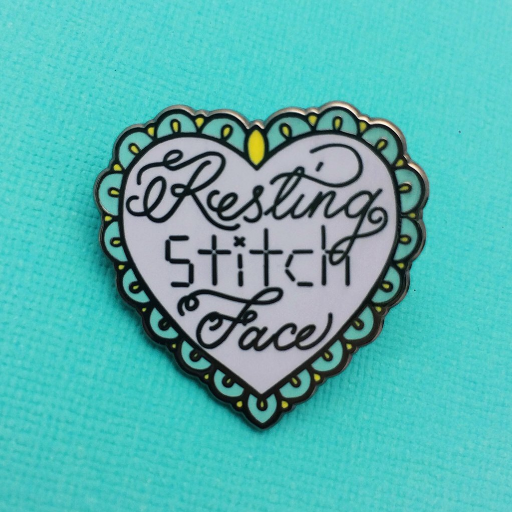 I'm a cross stitcher, so this would work well for my resting stitch face! I also love the Feed Me Cake pin and the Grab Them By The Patriarchy pin. 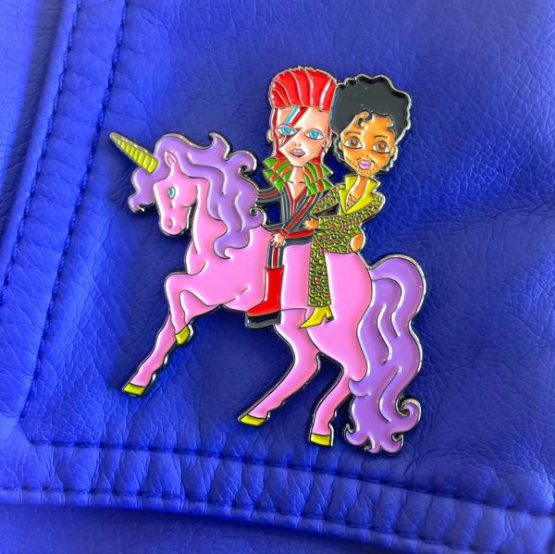 While this is a bit of a pricey pin, is there anything better than Bowie and Prince riding a pink unicorn? I also love the Back To Black tribute pin and the Pink Moon Sparkle Nail Polish pin. 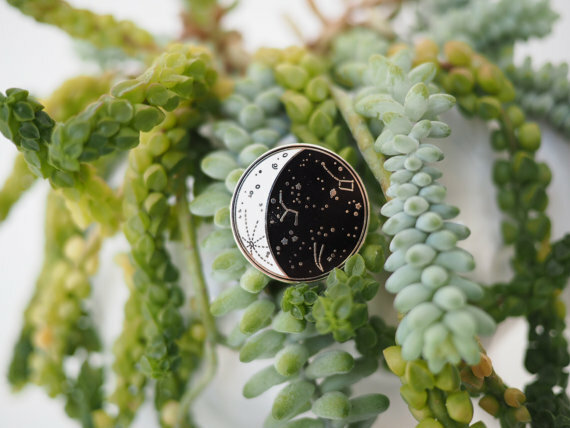 I don't think I need to say anything about this little guy - it's a moon phase with rose gold constellations. If that doesn't appeal to you, I'm not sure what will! I also love the Feeling Peachy pin and the Bloom Where You Are Planted patch. I love this patch because it reminds me of old films, but also because I do believe in aliens. There must surely be life out there in this big old space we live in! I also love the It Takes Guts patch. I've had a fascination with octopi for as long as I can remember. 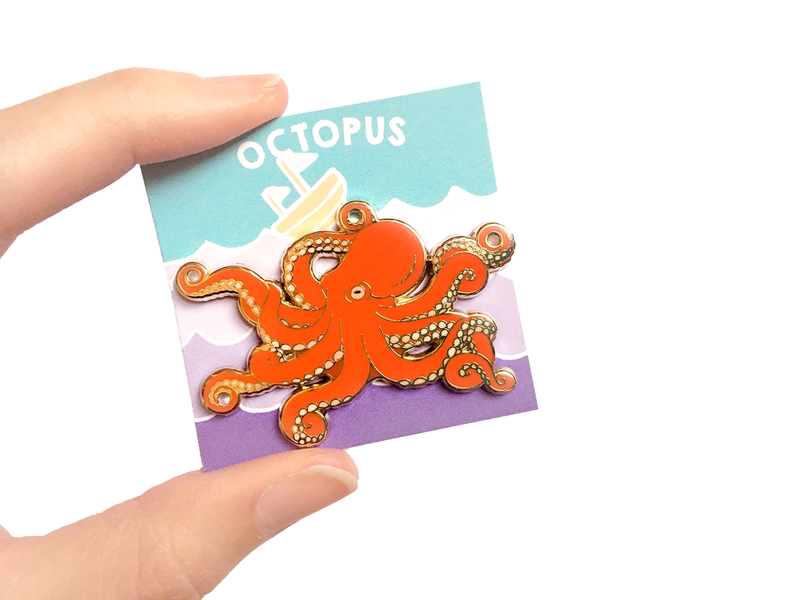 I've got octopus themed jewellery, a piece of octopus art on my wall and I even designed J a tattoo that featured an octopus attacking a ship, so I am all about this pin! I also love the Blue Body Positive Mermaid pin and the Cactus Club patch. Yup, another Bowie pin, but what can I say? I absolutely loved the man! 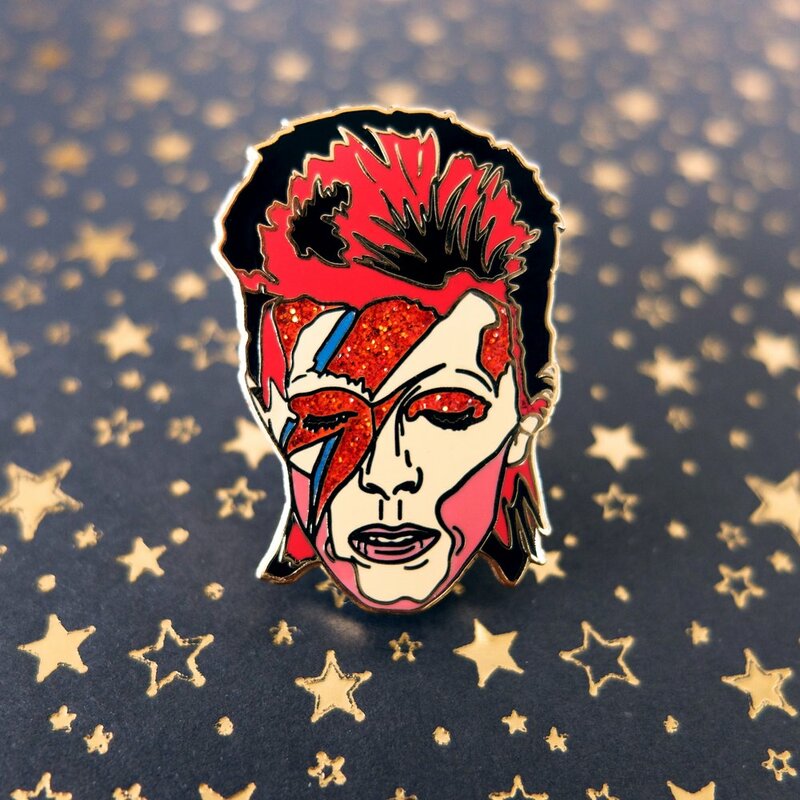 Aladdin Sane is one of his most recognisable characters, so this would be a pin that everyone would be able to understand. Plus, glitter, need I say more? I also love the Louis Theroux enamel pin. How stunning is this? 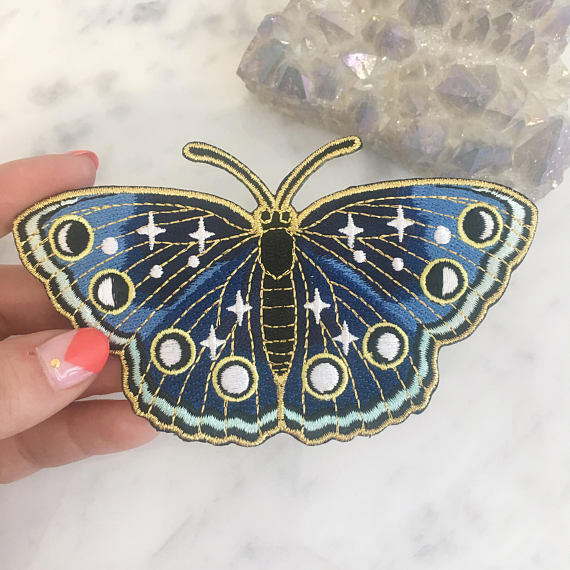 I love the way that the designer has incorporated the moon phases into the butterfly's pattern and those colours are to die for! I also love the Stay Woke patch, the Seashell patch and the Crystal patch. It has taken so much of my willpower to sit and take all of these links from the sites without buying anything! There are just so many gorgeous patches and pins on the market, and like I said, I don't know if it's trendy anymore, but there just seems to be more and more everywhere I look! While I bloomin' love looking at them all, it really makes my bank balance cry. 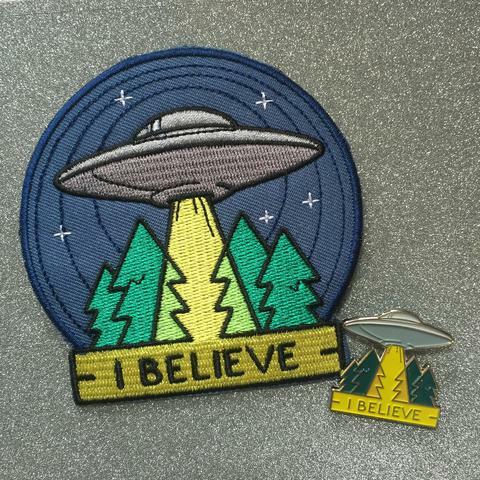 Do you have any patch or pin shops that you think I should look at? I don't think pins ever quite caught on in South Africa. I love how they all mean different things and pay tribute to moment in time or people! I'd say they're still in fashion! Just the other day I noticed the Levi shop have lots of different patches to personalise jeans. I've never really did clothes DIY before but yesterday I bought two vibrant budgie transfers which I'm hoping to iron onto a sleeve of a plain white t-shirt. I got them from the gift shop in Jesmond dene (which I don't know why I hadn't visited earlier!) they weren't badly priced either!